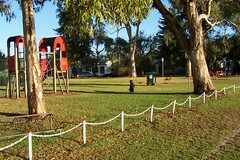 In the mornings before breakfast I take Monty for a walk at the local oval. There are two other people and their dogs that walk at the same time and we all walk together. Monty is very used to this now and has decided that I’m being looked after by these people so she takes the liberty of sniffing around way over the other side of the oval which doesn’t sit well with me because if she sees a cat across the road she has absolutely no regard for traffic that might be coming. She has nearly been run over before because of this. The thing is if it’s only me and her she’ll stick to me like glue being oh so protective. Lately if she does the wandering, when I’ve finally caught up with her, I’ve put her on the lead which defeats the purpose of walking around an oval where she doesn’t have to be on the lead. So, this morning I went armed with a little bag of dog biscuits and every time she so much as looked like she was going to wander too far away from me I got out a tasty treat and she came over and took it. By the end of the walk my fingers were yukky from her dog dribble but she stayed near. UPDATE: I’ve done the Hansel and Gretel dog biscuit thing ever since then – I know it’s only a few days really – and I’m bribing her with less and less biscuits and she’s staying near.